I can't believe it's November already. Time flies when you're wrestling wet yarn and wriggly children! I've got a bunch of new stuff for you this week, so if you want to jump straight in you can see it here. 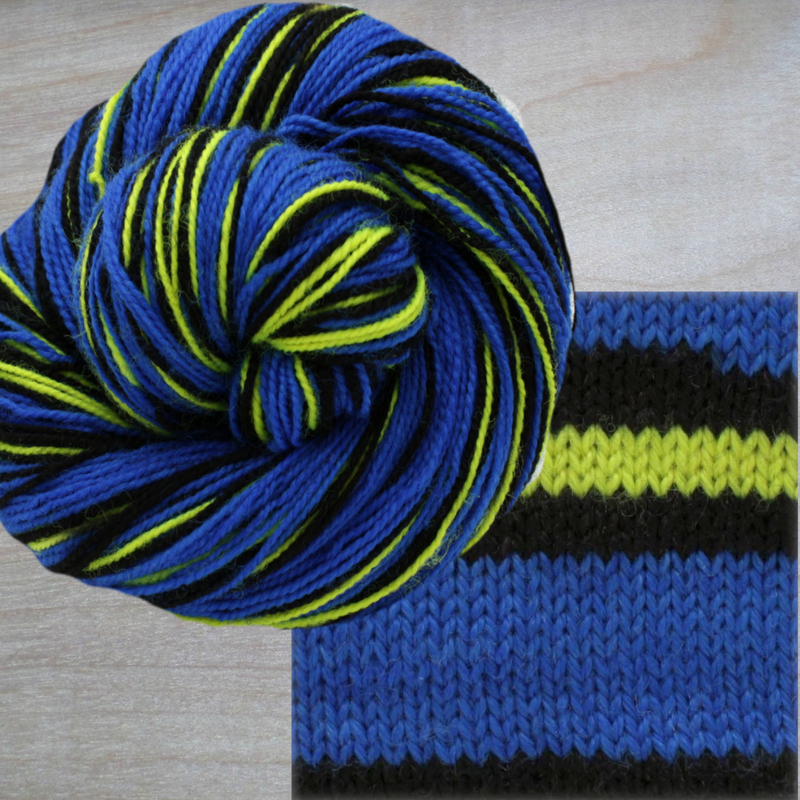 The first new color for you this week is Penumbra. A complex stripe, this one has 7 rows Navy, 3 rows Pale Violet, 7 rows Byzantium, 3 rows Pale Violet, 7 rows Black with white specks, 3 rows Pale Violet, 7 rows Dark Iris, 3 rows Pale Violet. 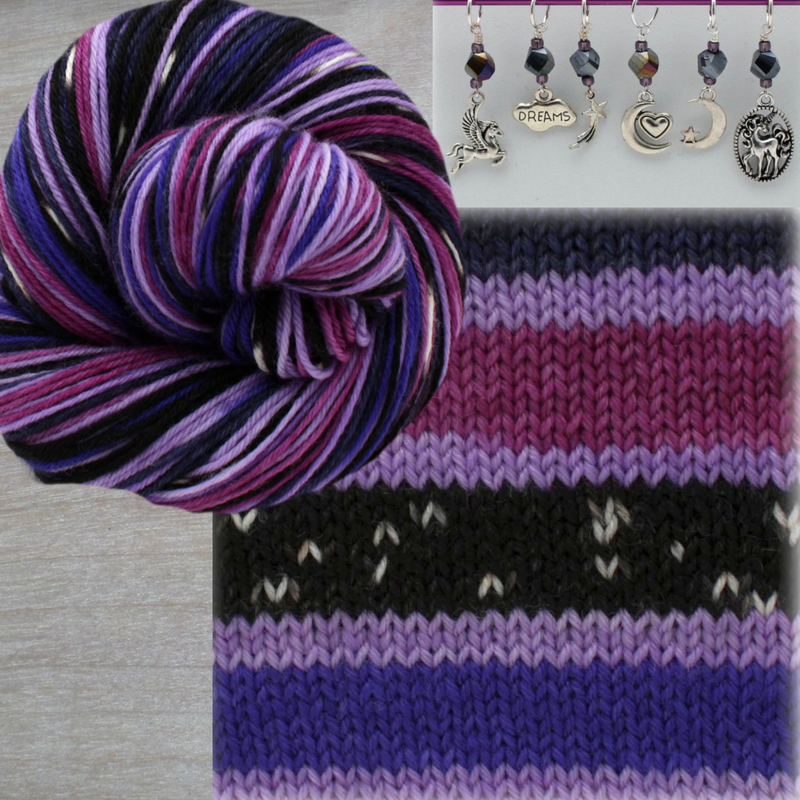 Like the other colorways in this series, you can get a limited edition set of stitch markers to go along with the colorway theme if you choose. I have large ring markers, or progress keepers you can purchase as a full set or individually. In astronomy, penumbra is the shadow cast by the earth or moon over an area experiencing a partial eclipse. You can find single skeins here. I have sock sets with the black and white speckle here. Second this week is my EYFC dyeing challenge for October, Noctilucent Clouds. The theme was mystical creatures, and you can see my inspiration image there. 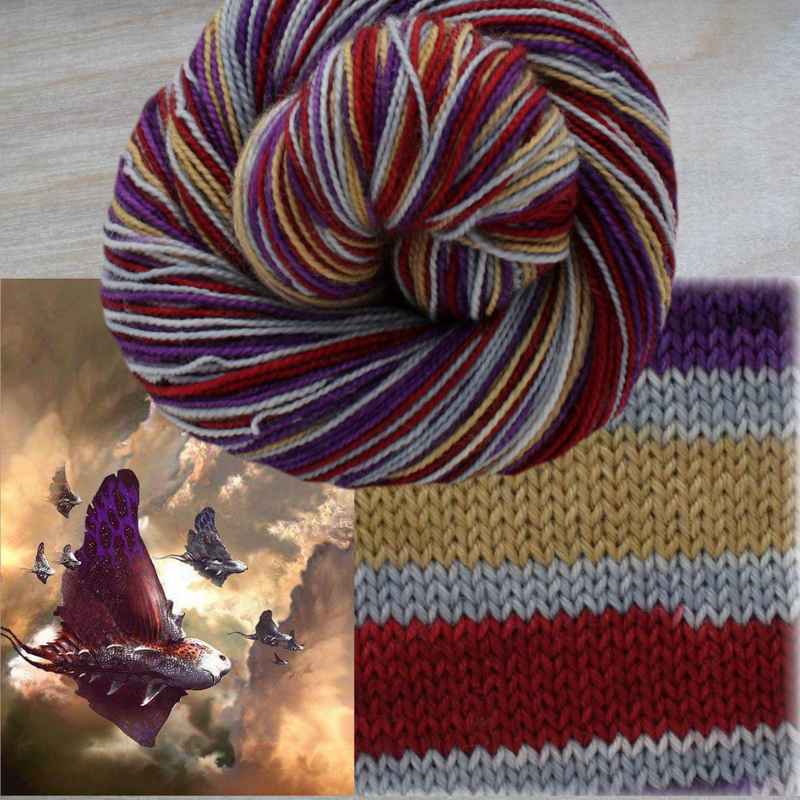 It's a complex stripey, with 7 rows royal purple, 3 rows pale steel, 7 rows tan, 3 rows pale steel, 7 rows dark vermillioin, and 3 rows pale steel. Noctilucent clouds, or night shining clouds, are tenuous cloud-like phenomena in the upper atmosphere of Earth. They consist of ice crystals and are only visible during astronomical twilight. Noctilucent roughly means "night shining" in Latin. You can find single skeins of this color here. Third is Beta Boswellic Acid, an even stripe with 7 rows each sour apple, sea foam, dark leaf green, dark brown, and amaranth. Boswellic acids are a series of pentacyclic triterpene molecules that are produced by plants in the genus Boswellia. Like many other terpenes, boswellic acids appear in the resin of the plant that exudes them; it is estimated that they make up 30% of the resin of Boswellia serrata. Beta-boswellic acid, keto-beta-boswellic acid, and acetyl-keto-beta-boswellic acid (AKBA) have been indicated in apoptosis of cancer cells, in particular brain tumors and cells affected by leukemia or colon cancer. 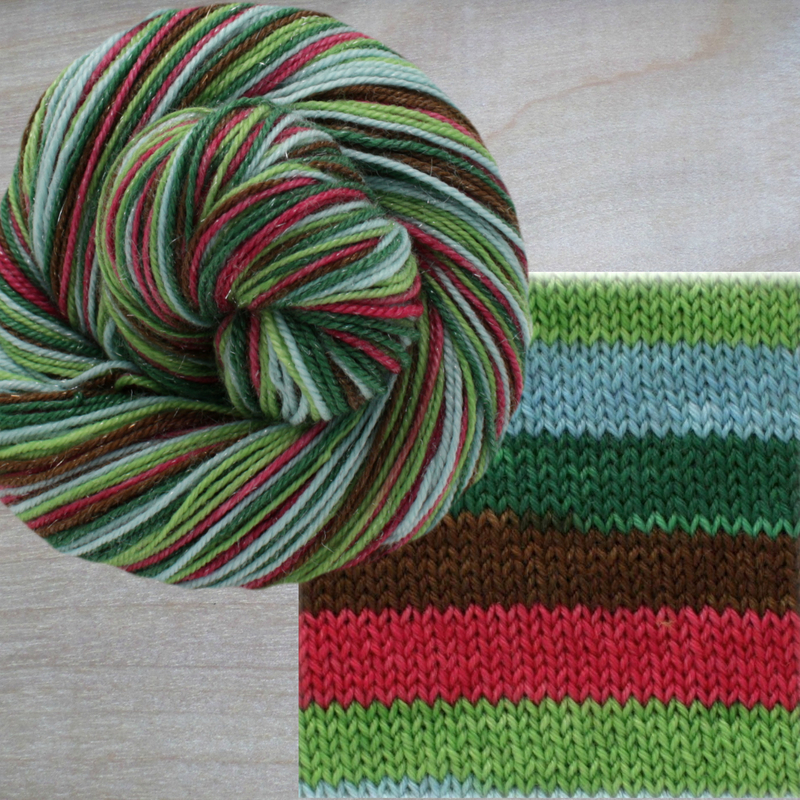 Sock sets with Amaranth heel skeins are here. Look, something shiny! What was I saying? Anway, Hippocampus is the next color, with 10 rows extreme blue, 3 rows black, 3 rows fluorescent yellow, and 3 rows black. The hippocampus is a major component of the brains of humans and other vertebrates. Psychologists and neuroscientists generally agree that the hippocampus plays an important role in the formation of new memories about experienced events. You can see projects in this color here. 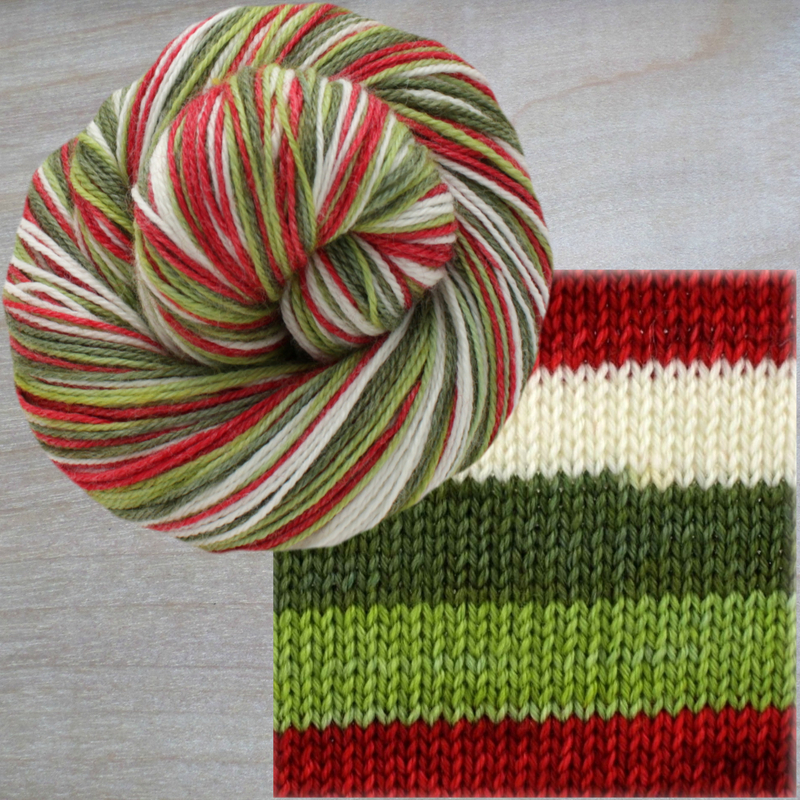 Next is Kinetic Energy, an even stripe with 7 rows fire red, blue-green moss, dark moss, and white. In physics, the kinetic energy of an object is the energy that it possesses due to its motion. It is defined as the work needed to accelerate a body of a given mass from rest to its stated velocity. Having gained this energy during its acceleration, the body maintains this kinetic energy unless its speed changes. You can find this colorway here. You can see lots of projects in this color here. Promethium is up next, with 10 rows radioactive and 10 rows white. Promethium is a chemical element with symbol Pm and atomic number 61. All of its isotopes are radioactive; it is extremely rare, with only about 500-600 grams naturally occurring in Earth's crust at any given time, and one of only two such elements that are followed in the periodic table by elements with stable forms, a distinction shared with technetium. Chemically, promethium is a lanthanide. Promethium shows only one stable oxidation state of +3. You can find this color here. You can find projects in this color here. 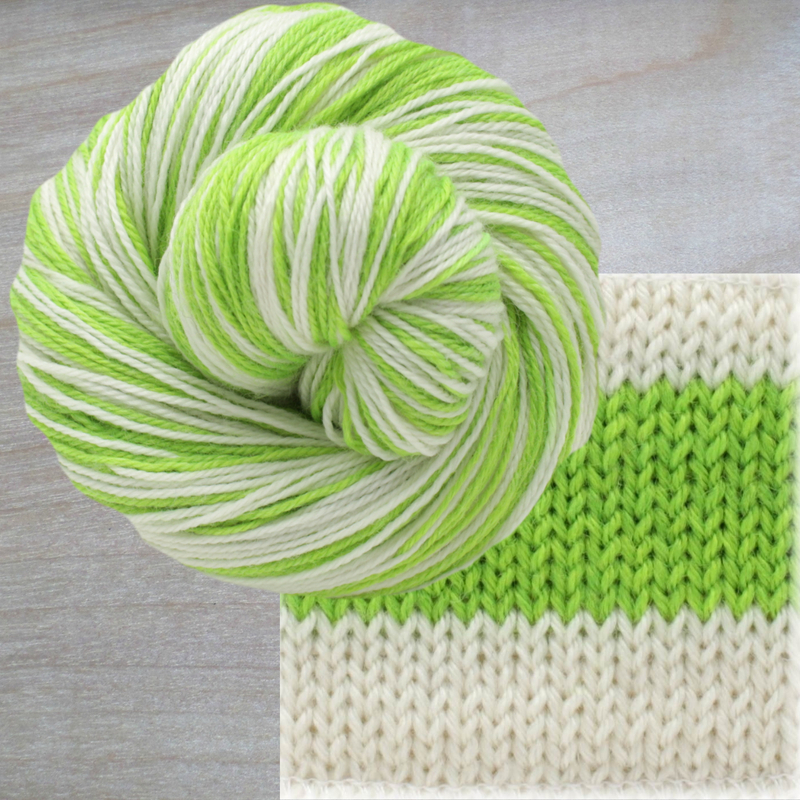 The last two colors are Iceberg (front) and Neutrino (back). Both are have 10 rows of white with 10 rows of the other color (extreme blue for Iceberg and pumpkin orange for Neutrino). An iceberg or ice mountain is a large piece of freshwater ice that has broken off a glacier or an ice shelf and is floating freely in open water. A neutrino is a fermion (an elementary particle with half-integer spin) that interacts only via the weak subatomic force and gravity. The mass of the neutrino is much smaller than that of the other known elementary particles. 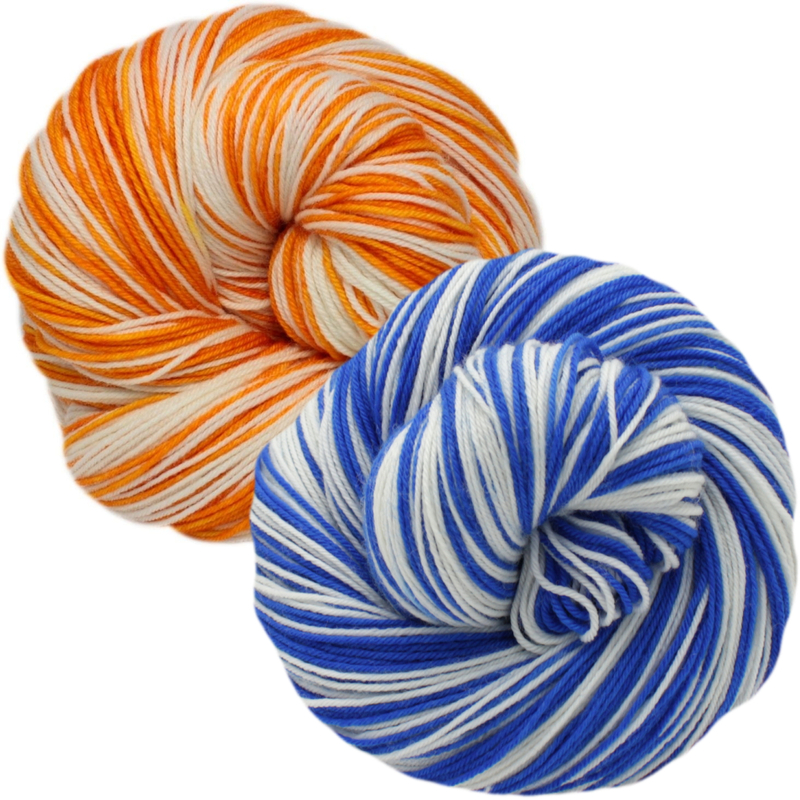 Both of these are very limited, just 3 skeins each. 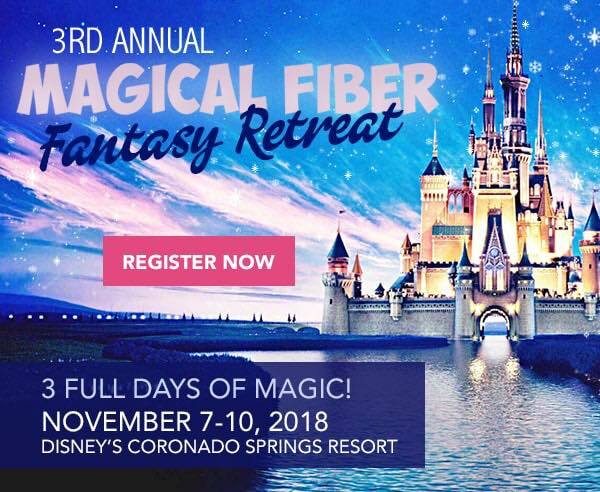 If you're in Orlando or near enough, next week all my yarn is going to visit the Fiber Fantasy Retreat at Disney! All the yarn will be taken down off the website on November 6th! You can find more info about the retreat here.